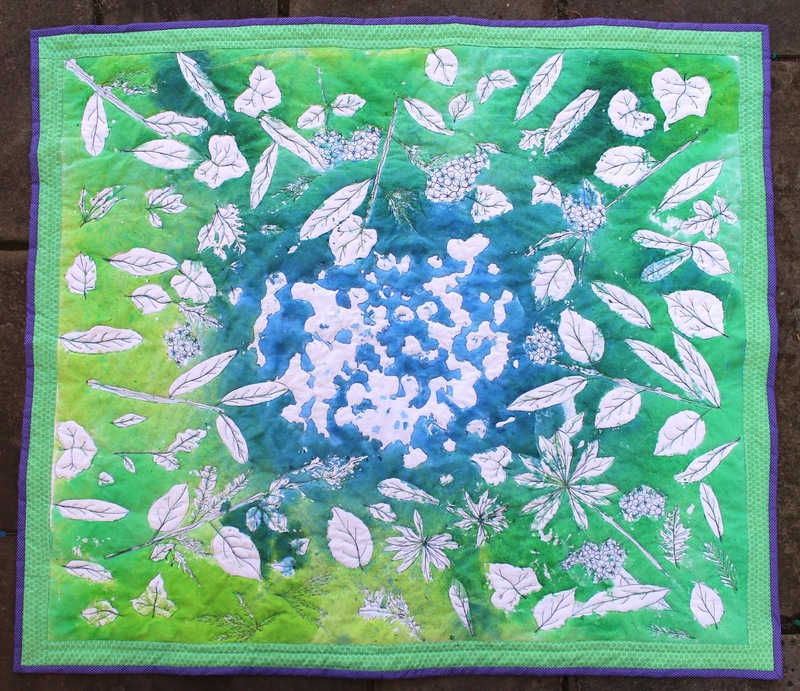 Make It Handmade: Kid Made Nature Batik Quilt with Rachel Rabbit! 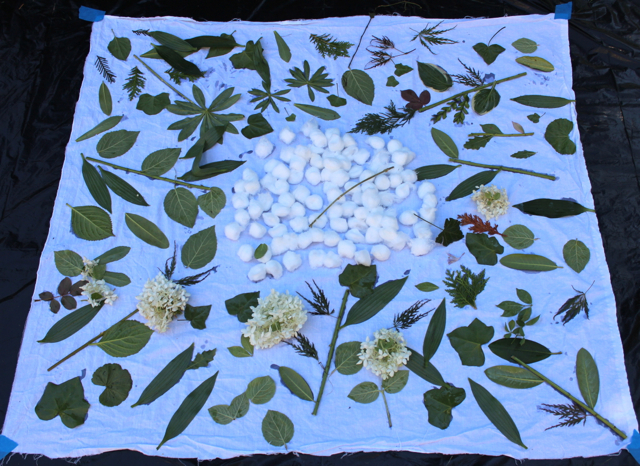 Kid Made Nature Batik Quilt with Rachel Rabbit! Have you noticed MIH's newest sponsor, ZipIt? Zip It zippers is the only place that I've bought my zippers for years, and I'm absolutely thrilled with them each and every time. They now have trendy metal zips and invisible zips at much better prices than your local fabric store. 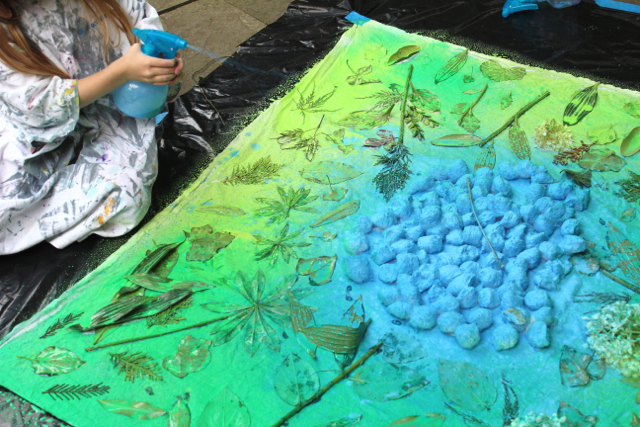 I'm absolutely thrilled to have Rachael from Rachael Rabbit over to share a Create With Kids project. I was absolutely floored when Rachel sent me a link to her blog-- and spent the next hour of my life reading her archives. 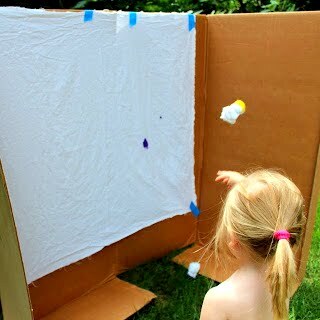 It's full of projects that you can do with even the youngest of kids. Even though her kids don't use the sewing machine, it's their work, style and creativity that's showcased in these projects. Before we get to the amazing project she's sharing today, I just have to highlight some of her (and her kid's!) past work. 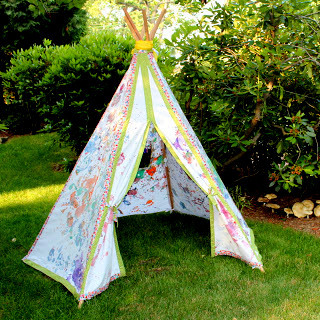 This Kid Painted Tee Pee is just dreamy-- Her kids painted the fabric, and then she sewed up the tent. How fun for the summer! 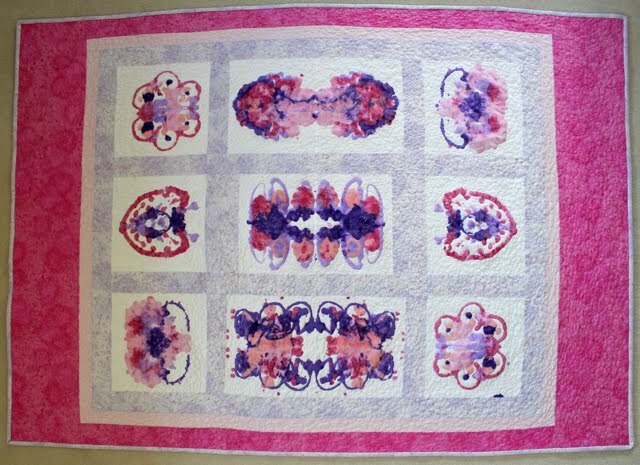 My favorite project of Rachael's is this quilt. Can you imagine how proud her daughter must be? It's absolutely gorgeous. She wins the award for Coolest Mom Ever for coming up with this idea! Paint bombs! Another kid painted quilt in the making! 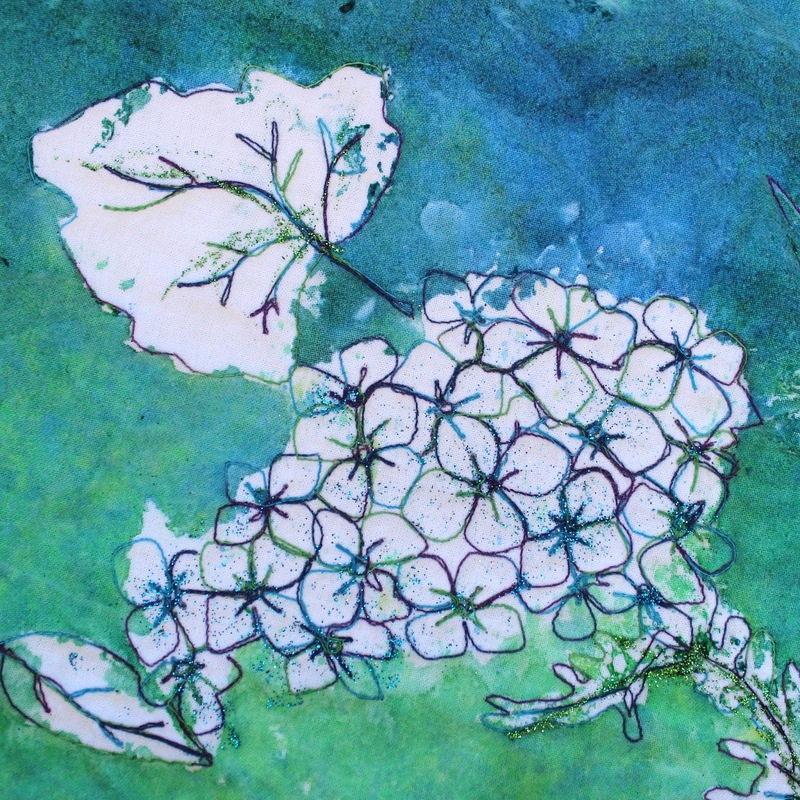 And now she's sharing how to make this Gorgeous batik blanket-- with your kids. I can't wait to try this! I am very excited that this post is being featured at Make it Handmade. 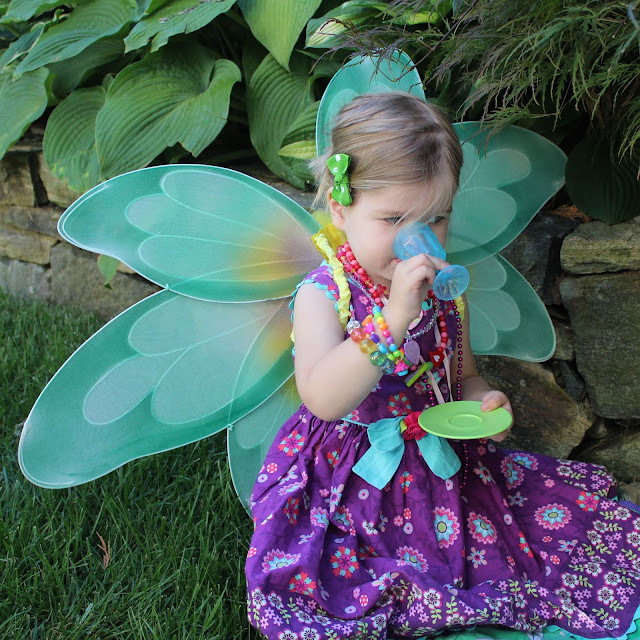 My girls love anything that involves copious amounts of glue and spray bottles. This project held their attention for 1+ hours - which I think must be a record for us! 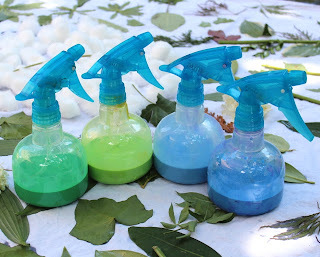 fabric paint - I use BioColor paint with their BioColor Fabric medium - it is non toxic and certainly works! The girls were told to dip things into the Batik EZ and then place them on the fabric. 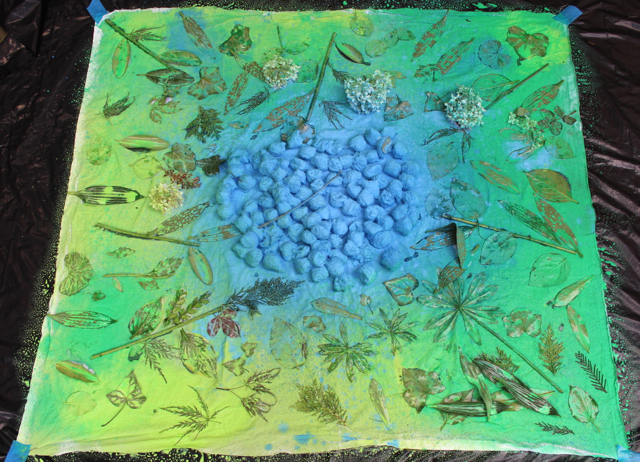 Our aim (I say 'our aim' but really is was 'my aim') was to make a sky with clouds in the middle and leaf prints and grass on the outer edges. 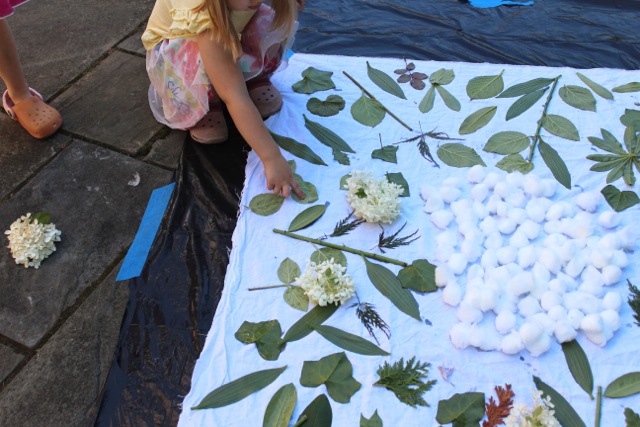 Putting the cotton balls apparently was boring and the girls wanted to move on to cutting leaves off plants and sticking them down asap. Once they had finished with the cotton balls I just emptied the remaining balls from the bag into the middle of the fabric - no additional Batik EZ. There was some consideration to where every leaf or flower should be put. Find a leaf, dip and stick. They didn't seem to tire of it. 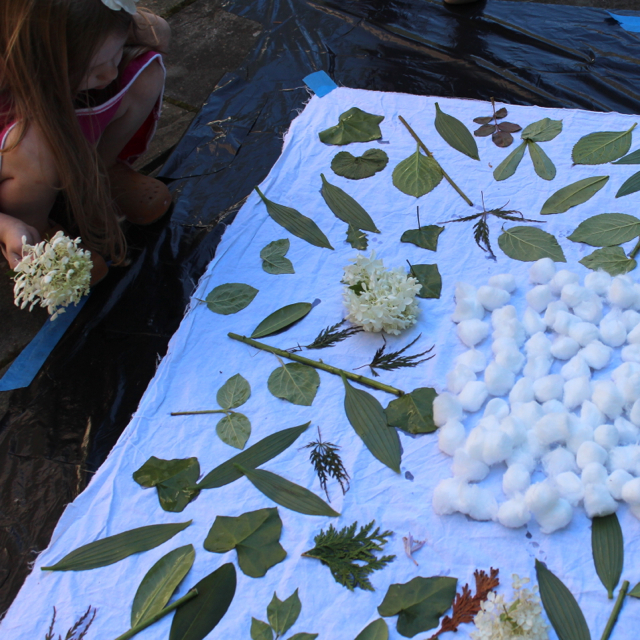 Here is our finished fabric after the cotton balls and leaves were all stuck down and they declared the project to be 'done'. What they didn't realize was that after lunch - once everything had dried we got to spray everything. 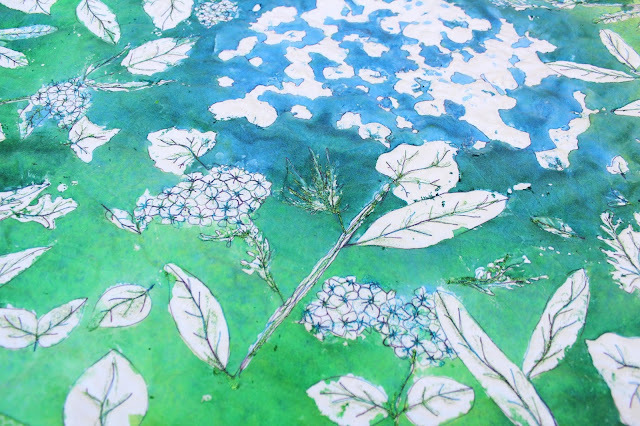 I used four colors - two green tones and two blue tones - I also watered down the BioColor Paint and Fabric Medium combo so the paint would be lighter. My four year old was good at following the 'blue in the middle for sky' & 'green around the outside for grass' instructions. But my 2 year old just sprayed what ever and where ever she fancied. Here is our fabric after the spray paint. We left it to dry in the sun & then I moved it into our boiler room where it sat for 5 days - just to make sure. 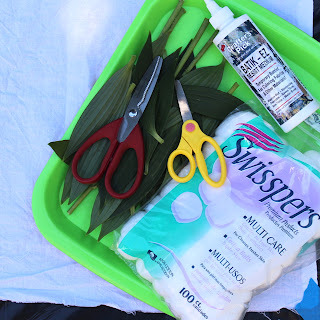 To remove all the leaves and cotton balls I just soaked the fabric in cold water. 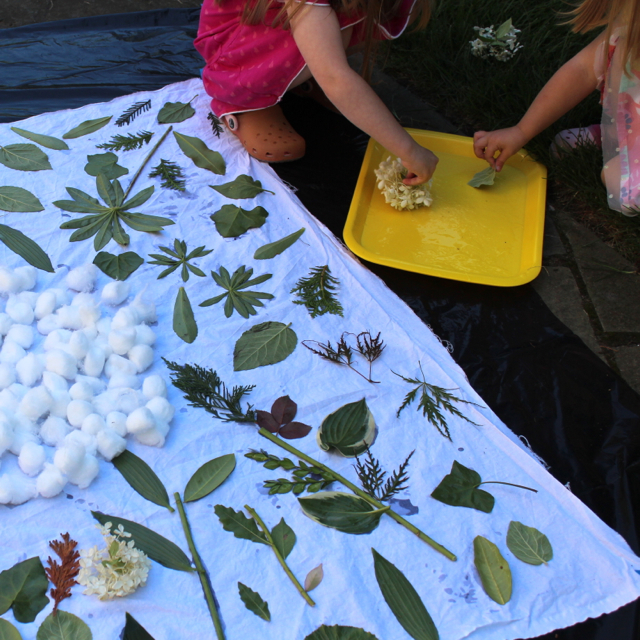 Everything came off very easily - but the waxy coated leaves (Ivy & Lillie's leaves) came off the easiest. I put the fabric into the washing machine and ran it on a hot cycle & tumble dried it on a hot cycle too. Once I had added a simple border to the fabric I layered, quilted and bound the picnic blanket. I don't think you need to quilt your picnic blanket like I did - you could tie it if that is easier. 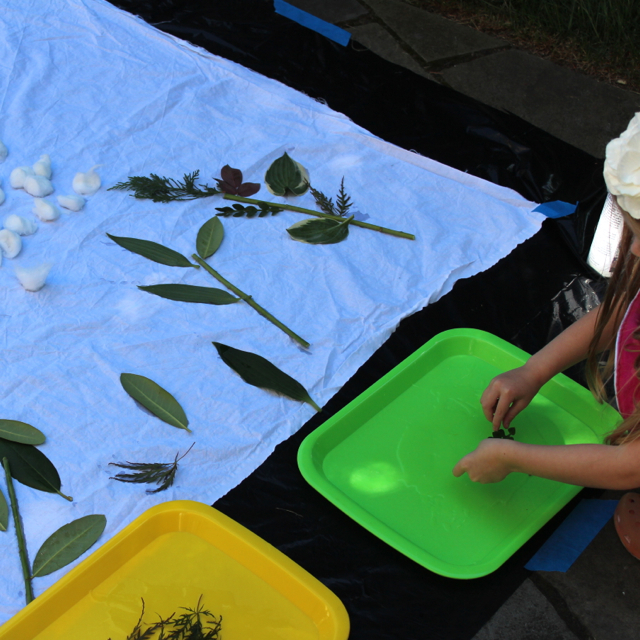 If your children are older you could also get them to outline the leaf shapes with a fabric marker. There are many directions you could take this idea. The girls LOVED having a fairy tea party in the garden with their new picnic mat. 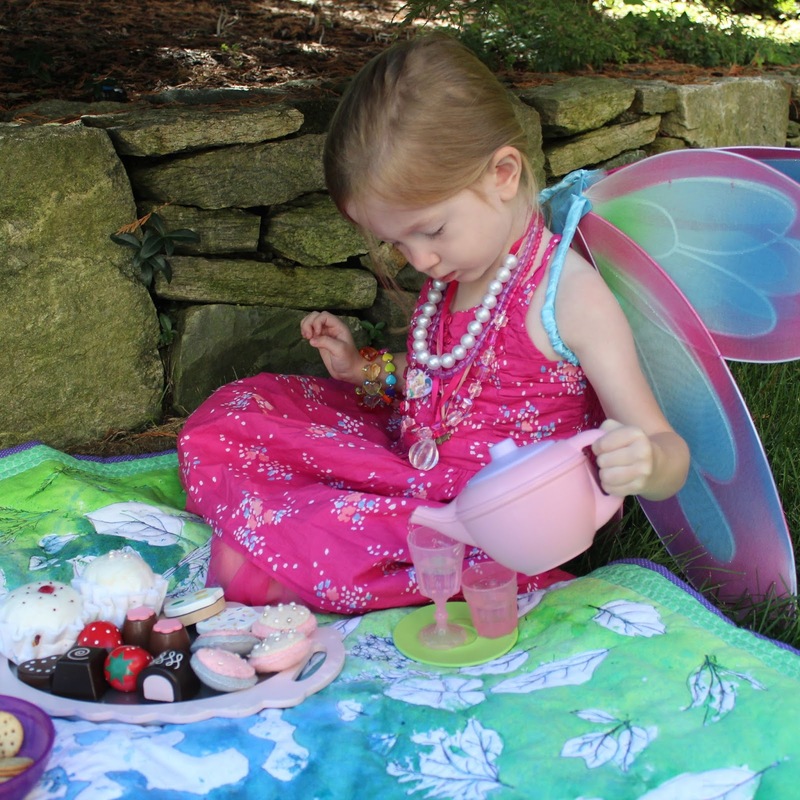 You can tell these kids are somewhat English by their tea party skills! 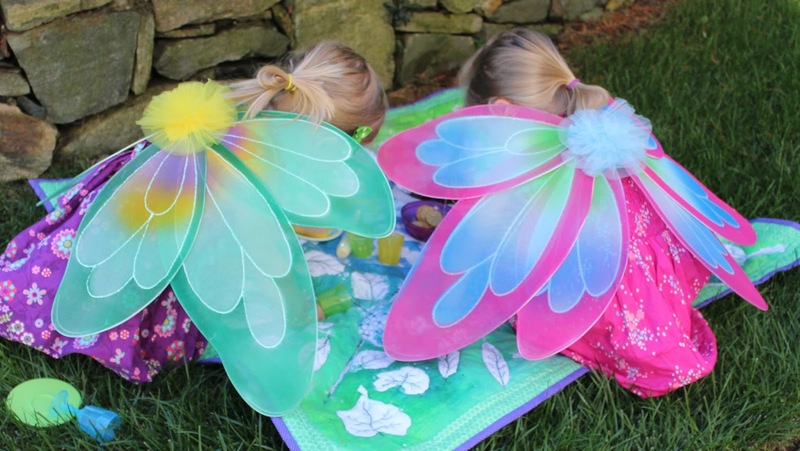 After the tea party was over the girls set about inspecting the clouds & leaves on the blanket. Thank you so much for sharing this tutorial Rachael! Our weather is cooler now, and this is a perfect time to pick leaves and twigs to work on this project. If you liked this post, head on over to Rachel Rabbit to see more of her awesomeness. 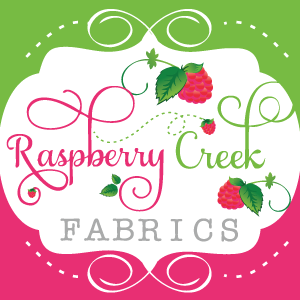 Rachael's also collecting fabric for a charity quilt-- check out this post for all the details. We'll see you back here on Friday for more handmade fun!